There's just one shopping day until Christmas! Fred is so wrapped up in his acting debut as Scrooge in the Bedrock production of "A Christmas Carol" that he's completely to buy any gifts. And worse, he's left baby Pebbles stranded at Cave Care Centre! But wife Wilma and a few familiar ghosts perform a true Christmas miracle, helping hubby Fred remember the true meaning of the season. Join Barney, Betty, Bam Bam, and Dino in this hilario..
1994's The Flintstones brought the modern Stone Age family - immortalized in the first animated series in prime-time history-to the live-action big screen. After an aptitude test mix-up, Fred Flintstone (John Goodman) trades his job as Slate & Company Bronto-crane operator for a vice presidency. But there's trouble brewing in Bedrock: An evil executive (Kyle MacLachlan) and his sinister secretary (Halle Berry) are now plotting to use Fr..
1994's The Flinstones brought the modern Stone Age family - immortalised in the first animated series in prime-time history-to the live-action big screen. After an aptitude test mid-up, Fred Flintstone (John Goodman) trades his job as Slate & Company Bronto-crane operator for a vice presidency. But there's trouble brewing in Bedrock: An evil executive (Kyle Maclachlan) and his sinister secretary (Halle Berry) are now plotting to use Fre..
Fred Flintstone (Mark Addy) and Barney Rubble (Stephen Baldwin) are two of Bedrock's most confirmed bachelors. Wilma Slaghoople (Kristen Johnston) and Betty O'Shale (Jane Krakowski) are two of the town's hottest single babes. In this prehistoric comedy of boy meets girl, see how it all began as Fred and Barney set out to win the hearts of their favourite gals on a romantic getaway to exciting "Rock Vegas." 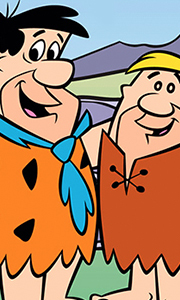 With meddling fron Wilma's soc..
Fred Flintstone (Mark Addy) and Barney Rubble (Stephen Baldwin) are two of Bedrock's most confirmed bachelors. Wilma Slaghoople (Kristen Johnston) and Betty O'Shale (Jane Krakowski) are two of the town's hottest single babes. In this prehistoric comedy of boy meets girl, see how it all began as Fred and Barney set out to win the hearts of their favorite gals on a romantic getaway to exciting "Rock Vegas." With meddling from Wilma's soci..
From the moment they arrived on the scene, The Flintstones lived up to the words of their immortal theme song: a modern stone age family that is a page right out of history. The lovable temperament of Fred Flintstone... the delicious digs of wife Wilma... the hilarious jabs of neighbour Barney Rubble. They're all present and (pre)hysterically accounted for in this 5-disc set of the 28 episodes of the entire (pre)historic first season t.. The prehistoric and prehysterically funny legacy grows larger on DVD with this fabulous 32-episode 5-disc set of Season Two! A perfect alchemy of adult humour, outlandish plots and childish pranks, The Flintstones offered cartoon characters that over time appear even more human and multidimensional than many of their live-action TV situation comedy counterparts. But the biggest ongoing series treat - the one that hooks each new generati..
Get ready for some action in this all-new, original movie that brings some of WWE’s toughest, wildest superstars to Bedrock! When Fred loses his family’s vacation money, he hatches one of his hair brained plans to get it back. It’s a sports entertainment spectacle that involves throwing Barney into the ring with the likes of John Cenastone, Marble Henry and even The Undertaker, with Fred himself as event promoter! The crowds roar, the “..
Own The Flintstones DVD from Deff, DVD, Blu-Ray & 4K Video Specialists - Free UK Delivery..
Own The Flintstones In Viva Rock Vegas DVD from Deff, DVD, Blu-Ray & 4K Video Specialists - Free UK Delivery..